In celebration of the upcoming Halloween holiday and the darker side of music and cinematic projects that become the focus of so many people this time of year, we have put together this quick Absynth horror synth tutorial! This Absynth horror synth is made in the Halloween spirit, with deep dark undertones mixed with resonant high frequency elements to accent the frightful nature of the mood. It can easily be tweaked in any number of directions to achieve a sound that will work with your specific projects, but as it is it will support any darker and moodier style of music. Whether you produce ambient soundscapes, dark Dn’B, Psy Trance or any other kind of music that happens to fall into the darker genres. Starting off with the channel A, a single oscillator is loaded with a Bass 1 waveform and the pitch is dropped just a hair over two octaves. 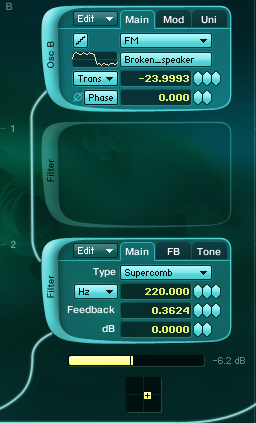 A Supercomb filter is added, as well. It has been panned slightly to the left to help make the sound wider, as well. This will be the main element in our Abysnth horror synth. Now onto channel B. Here an FM oscillator is loaded with a Broken Speaker waveform and the pitch is dropped just shy of two octaves. 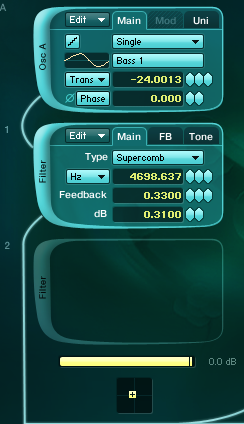 A Supercomb filter is added to shape the sound and introduce some movement and character. This channel is panned slightly to the right to widen the sound. This will be our second strongest audible signal. On channel C a double oscillator is loaded with a Square Fractal waveform and the pitch is dropped just over two octaves. 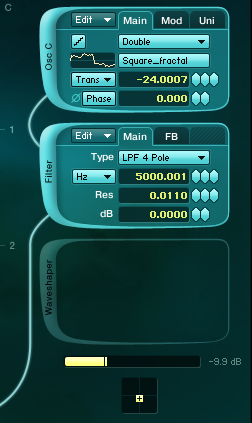 A 4 Pole Lowpass Filter has been added, which completes our core sound. 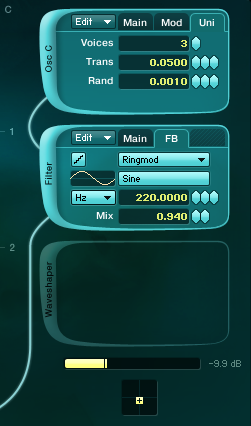 This sound is moved just under center of the stereo spectrum to push it towards the background, as it is a small atmospheric element. 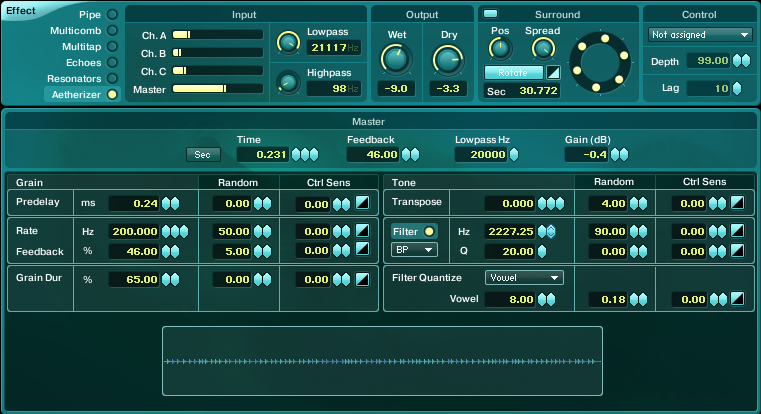 It is the quietest piece of this Absynth horror synth. 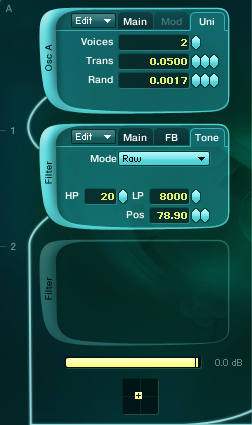 Now to set up the filters and effect on the master channel. 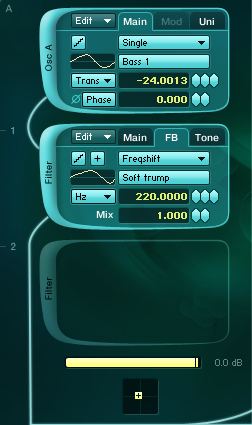 A Cloud granular filter is added to bring more atmosphere and depth to the sound. 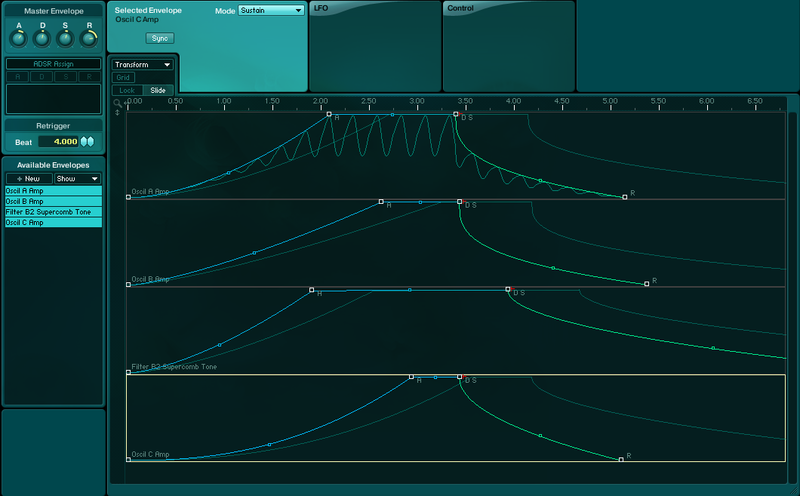 A 4 Pole Lowpass Filter is added to shave off the highest frequencies and add more resonance to the synth. 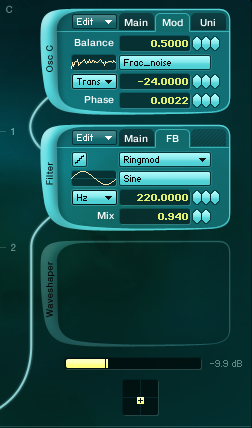 And an Aetherizer effect is inserted to really transfer this sound into our Absynth hours synth. 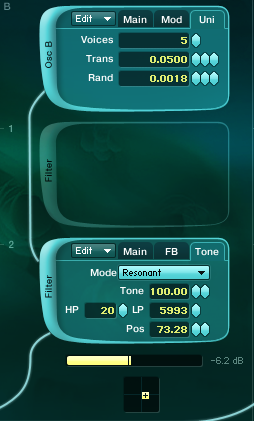 Before we look at the Aetherizer settings, you can see the envelopes for all three main channels, as well as a simple envelope that has been assigned to modulate the Tone parameter of the Supercomb filter of oscillator B. You will also notice that the Master Envelope has also been set up to ensure a slow and smooth delivery of the sound. The last big step of the process is to set up the Aetherizer. It has been applied to both the individual channels and to the master channel to better target the sounds that will be modified. The biggest things to take notice of initially are the wet/dry output mix and the surround settings. 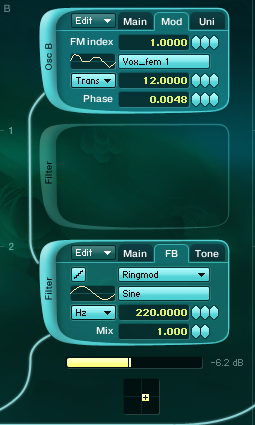 There have been changes made to the Grain parameters and a Bandpass filter has been inserted to finish shaping the sound. Below is an audio sample that shares what this Absynth horror synth sounds like without any kind of processing beyond what was shown here inside of Absynth. If you have a tutorial request, or would like to share one of your own with the world, please let us know by shoot a message our way before you leave the site today. Thanks for stopping by!